Savage, Minnesota, February 7, 2019 – Beckhoff Automation will show multiple new technologies that bolster material handling and logistics operations at ProMat 2019 in Chicago. The North American product debuts include the ultra-compact CX7000 embedded controller and a preview of EtherCAT G gigabit industrial Ethernet technology. The 45,000 industry professionals from 115 countries expected to attend the trade show from April 8 – 11 will also find the latest innovations in space-saving distributed servo drive technology and flexible TwinCAT 3 automation software at the Beckhoff booth (S-4512) in the south building of McCormick Place. Expanded EtherCAT offerings on display will include the EK1000 EtherCAT TSN Coupler and innovative EtherCAT G offerings. The EtherCAT TSN approach will assist distribution centers in the implementation of real-time systems. Ideal for new installations or retrofits, this flexible technology will keep pace with rapidly evolving networking methodologies in the material handling industry. 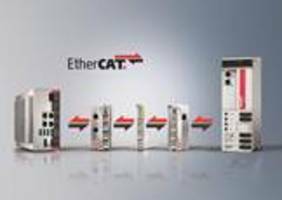 Furthering this goal, Beckhoff also recently announced EtherCAT G and EtherCAT G10, which will provide communication at 1 Gbit/s and 10 Gbit/s, respectively, in conformance with the IEEE 802.3 Ethernet standard. An innovative branch controller model will enable the parallel operation of standard 100 Mbit/s segments with EtherCAT G or G10 as the main trunk, or vice versa, to provide the fast communication needed in today’s distribution centers. The recently introduced Beckhoff CX7000 embedded controller presents a compact yet powerful EtherCAT controller, boasting a single-core, 400 MHz ARM Cortex™-M7 processor. The DIN rail-mountable controller maintains minimum footprint with dimensions of just 49 x 100 x 72 mm. Along with the ability to directly connect to the full range of Beckhoff EtherCAT I/O modules via a backplane, it has eight 24 V digital inputs and four outputs built into the device. With a low price point and the ability to leverage feature-filled TwinCAT 3 automation software, the CX7000 extends the range of Beckhoff controllers to include both ultra-compact controllers that can act as distributed control devices on the EtherCAT network across distribution centers all the way up to powerful many-core controllers capable of controlling entire warehouses. Also appearing at ProMat will be compact multicore automation solutions such as the C6015 Industrial PC (IPC) with an Intel® Atom™ processor and the C6030 IPC available with Intel® Core™ i-series processors. These are ideal for mid-range to complex machine control, but they can also be used for other functions such as edge computing and IoT gateway devices to connect existing systems to major cloud platforms, such as Microsoft Azure, Amazon Web Services (AWS) and SAP HANA. Both IPCs are among the fast-growing assortment of Microsoft Azure Certified industrial devices from Beckhoff. Beckhoff will showcase many other exciting automation technologies at ProMat for the first time. Increasing its IoT and smart factory offerings, Beckhoff will also display the latest solutions from TwinCAT Analytics and HTML5-enabled TwinCAT HMI software for industrial displays and mobile devices. In addition, surprise announcements are planned at ProMat regarding updates to TwinCAT 3. Other smart factory innovations will include the AMP8000 distributed servo drive system with One Cable Automation. Combining a servo drive and servomotor in one space-saving device enables enclosure-free motion control architectures. The system minimizes machine and equipment footprint while increasing cost effectiveness by integrating STO and SS1 motion safety functions. Additional savings are achieved through reductions in electronics, mechanical hardware and cabling through the EtherCAT P One Cable Automation solution available in AMP8000 and a wide range of Beckhoff I/O devices.